Today I found out Duct tape was originally named “Duck” tape and originally only came in green, not silver. As to why it was originally called “Duck” tape by the soldiers isn’t entirely known. It is commonly thought that because it was green and shed water, like a duck, the soldiers took to calling the tape “Duck” tape. An alternative theory is that they called it thus because it resembled strips of cotton duck. Which one is true or if it was a combination of the two, isn’t known, but in either case they called this new tape “Duck” tape. Soldiers began noticing it wasn’t just good for waterproofing ammunition casings, but also worked great for repairing things. They began using it for repairing jeeps, guns, and aircraft. Due to its waterproof nature, strength, and built in adhesive, they even began using it as a temporary means to close up wounds in emergencies; this is fitting because the closest predecessor of duct tape was also a Johnson & Johnson product used as medical tape. So how did “Duck” tape eventually come to be known as “Duct” tape and be sold primarily silver in color instead of army green? When the soldiers of WWII came home, they brought “Duck” tape with them. Shortly after their return, the housing market was booming. Some manufacture then got the bright idea to start selling it as a means to connect heating and air conditioning ducts; this idea caught on among home manufacturers and they started using it in many of the new homes being built. To allow for this usage, the tapes primary color was switched from green to silver, so that it would match the ducts. Soon the tape began being referred to as “Duct” tape instead of “Duck” tape. Ironically, researchers at the Lawrence Berkeley National Laboratory, Environmental Energy Division concluded that you should never use Duct tape to seal ducts. Their tests showed that under typical duct conditions, duct tape becomes brittle and will fail quickly. Duct tape also can catch on fire or just smolder and produce toxic smoke. Because of this, it’s usage on ducts has been prohibited by the state of California as well as in building codes in most of the U.S. In March 2003, three people died of suffocation after following Homeland Security’s suggestion of creating a “safe” room from chemical warfare by sealing up all windows and doors with thick plastic and duck tape. NASA also used Duct tape during the Apollo 17 mission to repair a damaged fender on the lunar rover, which was critical to keep lunar dust from the rover’s rooster tails from damaging the rover. 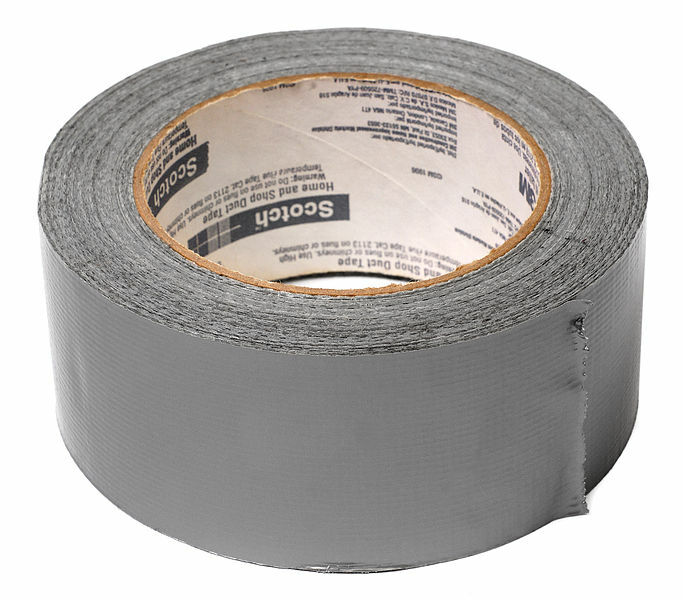 Duct tape is composed of three layers. The top layer is a plastic, polyethelyne; the middle layer is a fabric mesh; the bottom layer is a rubber-based, pressure sensitive adhesive. It was originally manufactured simply by pressing these three layers together. A Walmart store in Springfield, Missouri sells more Duct tape per person than any other place in the world. Springfield, Missouri is also considered the “Duct tape capital of the world”. The original military green colored “Duck” brand tape is still sold and manufactured by Manco, a division of Henkel. Duct tape is now primarily manufactured by over eight different companies, the largest distributor of which is “Duck” brand Duct tape, manufactured by Shurtape Technologies in Hickory, North Carolina. Gorilla Glue brand Duct tape uses a variation on the standard Duct tape sold by other manufacturers. In order to make it stronger, they use two offset layers of fibers, instead of one layer. They also added more adhesive. This is total crap. It came in silver, not green and was not used in WWII to waterproof ammunition cases. It is silver and called duct tape because it was originally used at joints of heating and cooling DUCTwaork to stop air leaks that reduced the efficiency of the heating and cooling systems. Try doing some actual research and use some logic before you post such stupid stuff. @James Smith: I think Johnson & Johnson, the company that originally created duct tape, might argue with you on that one. No one “died” from the duct tape deal that the DHS suggested. The people that died did have a room sealed with duct tape, but the had a coal-fired heater that literally sucked the air from the room they were in. So it was not just a room sealed with duct tape. It also happened in the city of Kfar Kassem, in Isreal. Do you think they listen to our DHS? Please do NOT pass on urban legends like that. A simple google search would’ve been a good thing for you to have done. I have had an experience snopes.com said they debunked as an urban legend. Ever since then I have questioned anything snopes says. It was never called duck tape until the makers of Duck Tape began their campaign to make sure everyone called it Duck Tape a few years back. It was invented by Permacel, a division of Johnson & Johnson back in the 40s and was used to seal ammo cans etc. and was found to work well in other areas especially air ducts as it was long lasting and flexible. I remember growing up, my dad would bring home “Gun Tape” which was essentially, GREEN Duct tape. I’ve seen it fix everything from plumbing to automobiles. As this article is likely to be read in the future I believe the subject requires a little clarification. Duct tape was originally called duck tape because the cloth backing came from something called cotton duck or duck canvas. There are several variants including duck, duct and gaffer tape. The first is meant to be waterproof and permanent and cannot be cleanly removed. The second is made with a heat resistant glue for air conditioning heating ducts as normal “duck” tape will fail under heat. The third “gaffer”is used in staging and lighting and is made to be cleanly removed unlike duck tape. Now this actually makes sense. It also explains how they could be confused with each other if you do not know this. Gorilla tape is also different from “duct” or “duck” tape (more of a super-duck\t tape that cannot be used for all the same purposes because it is not very flexible). It also explains how the “Duck” brand has a reputation for being the best around (because it is the original “duck” tape). I thought “duck” was just a play on the word “duct” and I could never understand how duct tape could be used for anything except ductwork. Now I see there is an actual difference between the two…or there *was*. Does this still hold true today? …Hmm, on second thought, there is this, from the duct tape timeline on Duckbrand.com : 1980– Jack Kahl officially creates a branded duct tape under the Duck® and Duck Tape® trademarks and becomes the first company to offer Duck Tape® colors. Duct (Duck) tape is a temporary fix for everything but, not a permanent repair anything !! …not true. If by temporary you mean “Doesn’t work after a few hundred years then nothing is permanent (except God). Its used in permanent manufacturing in many areas.